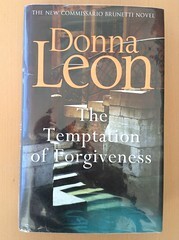 Set against the familiar background of Italian corruption at all levels, The Temptation of Forgiveness is our 27th police procedural in the erudite company of Commissario Guido Brunetti. When a man is found badly injured after a late night attack on the steps of one of Venice’s many bridges, the victim’s wife turns out to be one of Paola’s colleagues, who’d recently spoken with Brunetti concerning her son’s suspected use of drugs. As Brunetti and his colleagues – Commissario Griffoni, Ispettore Vianello and Signorina Elettra – investigate, preconceptions and prejudices come into play, and moral dilemmas abound.